Place the butter in a bowl, whisk in the sugar and salt. Add the egg and continue to beat until the mixture becomes lighter in colour. Mix the cocoa powder and flour, add and quickly combine to form a dough. Flatten the dough, cover and chill for approx. 2 hrs. On a lightly floured surface, roll out the dough in batches to approx. 4 mm thick. Cut out the hearts, place on two baking trays lined with baking paper. Place the butter in a bowl, whisk in the sugar and salt. Add the egg and continue to beat until the mixture becomes lighter in colour. Add the flour, quickly combine to form a dough. Flatten the dough, cover and chill for approx. 2 hrs. On a lightly floured surface, roll out the dough in batches to approx. 4 mm thick. 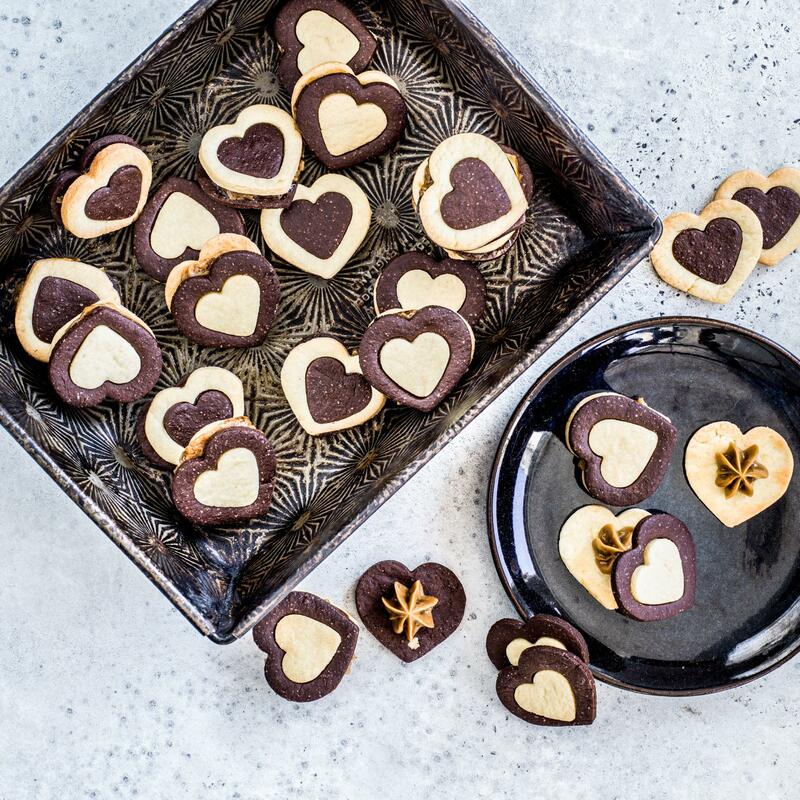 Cut out the hearts, place on two baking trays lined with baking paper. To bake Approx. 7 mins. in an oven preheated to 180°C (convection). Remove from the oven, leave to cool on a cooling rack. Place the water, coffee powder and sugar in a pan and reduce to approx. half the amount over a medium heat. Slowly stir the warm, thick syrup into the egg yolk, briefly continue stirring. Stir the mocha mixture into the soft butter (room temperature) one spoonful at a time, cover and chill for approx. 15 mins. Transfer the cream to a piping bag with a serrated nozzle (8 mm in diameter), pipe onto half of the hearts, place the remaining hearts on top. Bake the biscuits, store in an airtight container for approx. 2 weeks. Prepare the coffee cream filling, fill the prepared biscuits, enjoy.